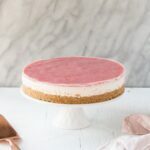 Easy to whip up No Bake Rhubarb Cheesecake! 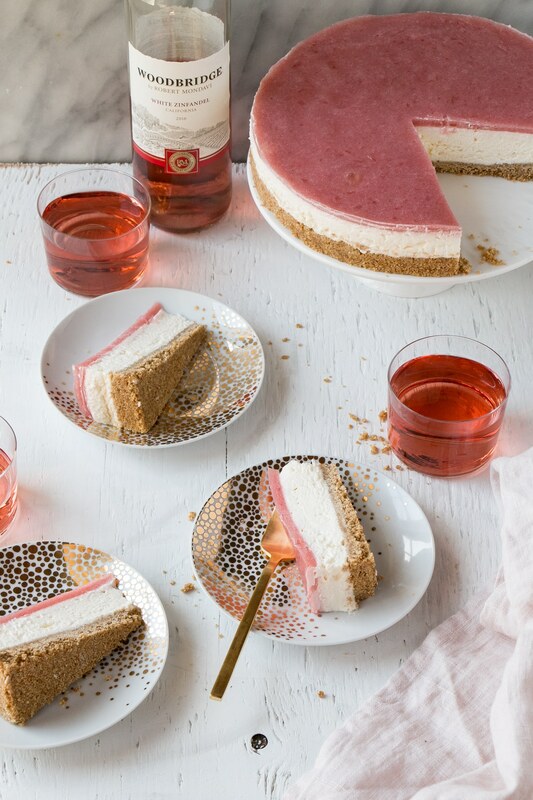 A delicious make ahead no bake cheesecake dessert that pairs perfectly with wine. Plus, some tips for entertaining with wine. This post is sponsored by Woodbridge by Robert Mondavi Wines. My Kitchen Love has been compensated monetarily and with product. I only work with brands I love and cook with (and sip on) at home. Please enjoy wine responsibly. 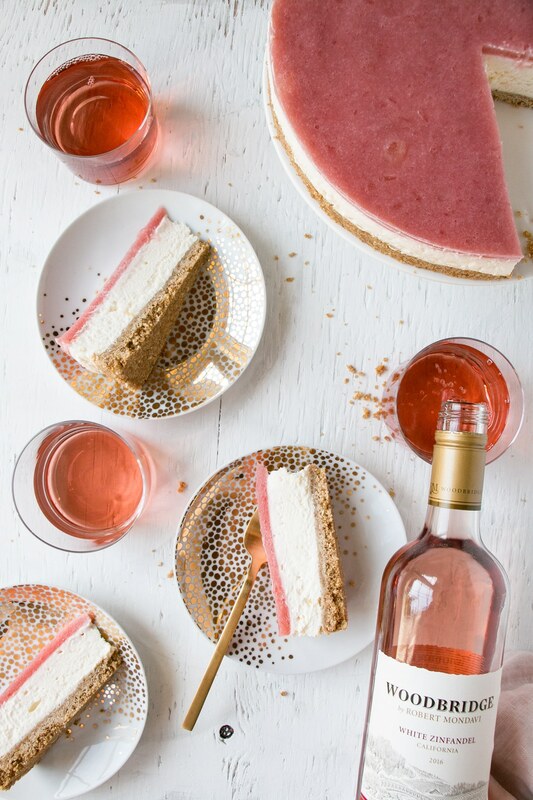 This No Bake Cheesecake with a Rhubarb layer is inspired by the White Zinfandel from Woodbridge by Robert Mondavi Wines. I’m a huge fan of rosé and its very photogenic pink hue. More than anything though, I love to enjoy it on a hot sunny afternoon or pair it with a treat that I can share with family and friends. Entertaining can be cumbersome, but why not take some tips from the experts? 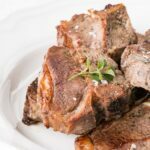 Pairing wine to food can feel overwhelming, but with tapping into the winery resources there are ample options for pairings. Cheese and wine are the usual ‘go to’ (which I totally appreciate), but sometimes, something more is needed for entertaining. How do you work your way from an appetizer to dessert? This Spring, jump onboard with Woodbridge by Robert Mondavi Wines for all the wine pairing answers while entertaining. Or simply pair wine with what you know works. For me, that is cheese and more tart desserts, which is why I came up with this No Bake Cheesecake. 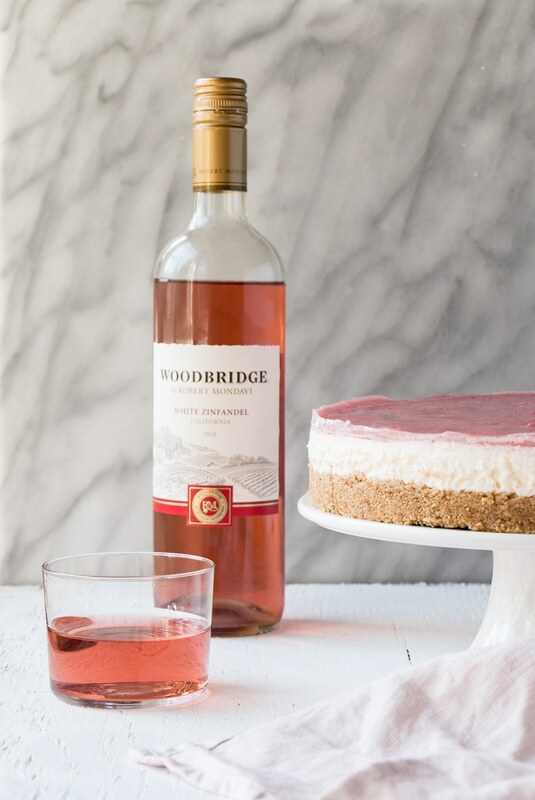 I love that there is a Woodbridge white wine for everyone – Pinot Grigio is crisp and refreshing; Chardonnay is smooth and flavourful; White Zinfandel is light and versatile (perfect for cheesecake really). Have you tried any? Which is your afternoon favourite? The Woodbridge by Robert Mondavi Wines style is marked by bright fruit flavours and smooth finishes made to complement food. In this case, the White Zinfandel pairs perfectly with a lighter and less sweet no bake cheesecake. How about reworking that cheese into a not too sweet make-ahead dessert that pairs perfect with rosé? This make-ahead No Bake Cheesecake is the answer. Rhubarb is a great pairings for wines that land on the off-dry or sweeter side of wine. 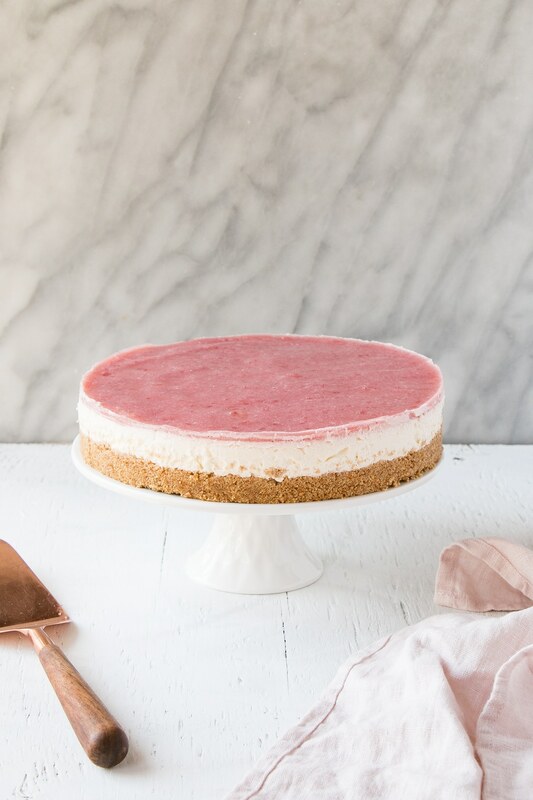 This cheesecake has very little sugar (and zero refined sugar in the rhubarb portion) making it perfect to those dessert-type wines. What do I love to pair with wine (beyond cheese of course)? These warm Spring/Summer days are ideal to celebrate everyday moments with family and friends. Make memories by pairing everyday meals and a white wine from Woodbridge by Robert Mondavi Wines and sharing it with family and friends. Stone Fruits such as peaches and plums with a Riesling to compliment the sweetness and viscosity of one another. Healthy Strawberry Rhubarb Bars: the kind of rhubarb where I still feel virtuous after eating. Rhubarb & Strawberry Tart: really quick and easy dessert that features rhubarb and strawberries over top of a light lemon cream. Sparkling Rhubarb Margarita: Sub White Zinfandel for sparkling wine and this would be a delicious rose cocktail! One of my favourite resources for pairing wine is What to Drink with What You Eat by Andrew Dornenburg and Karen Page. It lists not only wines and spirits and which foods go best, but also which foods go with with alcohol flavour profiles. 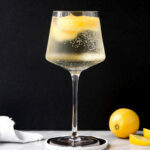 Do you have a favourite way to pair wine or cocktails with food? I’d love to hear about it, please drop me a comment below if you do! 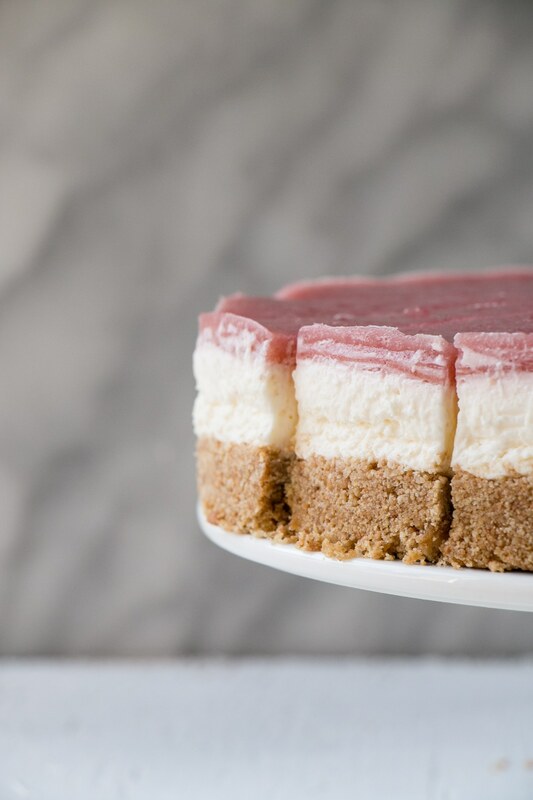 Easy to whip up No Bake Rhubarb Cheesecake! A perfect make-ahead dessert that pairs perfectly with wine. Line the bottom of a 9 or 10" springform pan with parchment paper. Spray pan with non-stick spray. Pulse graham crackers in a food processor (or crush in a zip-lock bag) and mix with melted butter. Press firmly into prepared pan (I use the bottom of a 1 cup measuring cup as mine have a flat smooth surface that works well). Place in fridge to chill. Place rhubarb, honey, and water in a medium saucepan over medium heat. Cook for 15-20 minutes. Remove from heat, add lemon juice and blend on high in a blender until completely smooth. Set aside. Beat cream cheese with an electric mixer (handheld or stand) until completely smooth. Scrap down the sides of bowl until there are no small chunks of cream cheese and it is completely smooth (I made the mistake of not beating my enough). Add whipping cream and beat until stiff peaks form, about 2 minutes. Add icing sugar, lemon juice, lemon zest, and vanilla. Pour mixture into graham cracker base and smooth top. Return to fridge. Once cheesecake is made and chilling in fridge. Place gelatin in a small bowl and top with boiling water. Stir with a spoon for a minute or so, until gelatin is completely dissolved. Add to rhubarb puree and stir. Top cheesecake with rhubarb mixture and spread evenly. Return to fridge and chill for at least 3 hours, although overnight is preferred*. * Cheesecake can be place in freezer (well wrapped with plastic wrap) for up to 3 months. Thaw in refrigerator overnight before serving. ** Use cream cheese found in a block and not the spreadable cream cheese used for bagels. I'm always trying to use less sugar when I bake, I'll have to try this cheesecake. 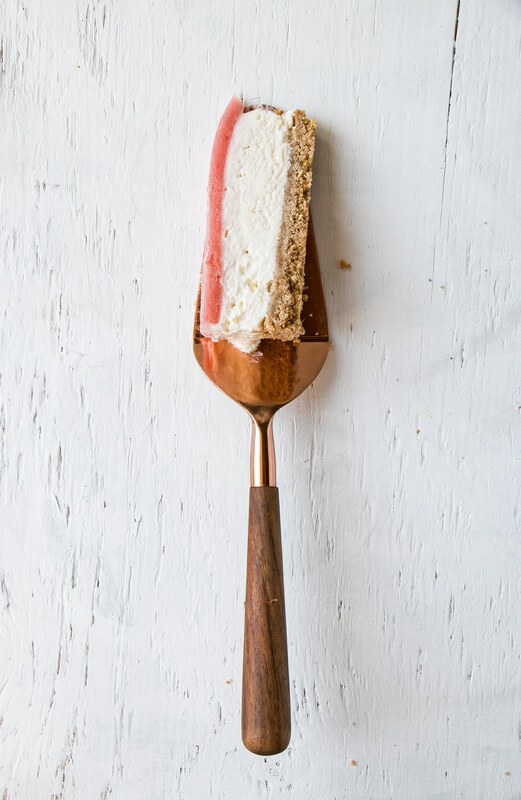 You can never go wrong with a no-bake cheesecake! And in this case the touch of honey pairs so well with the rhubarb! This cheesecake sounds amazing! I love the combination of the sweet and the tart. 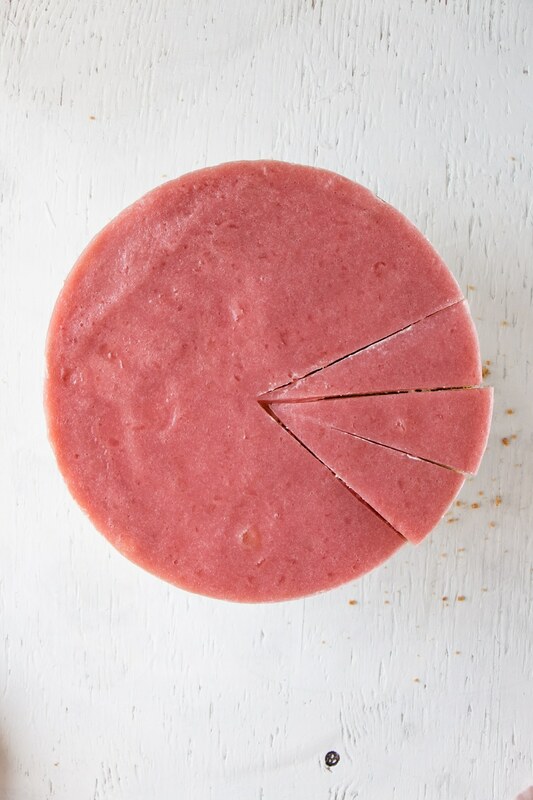 I love that it's a no-bake cheesecake even more. I can't wait to try it. Thank you so much! For me, no bake is definitely the way to go when it come to cheesecake. 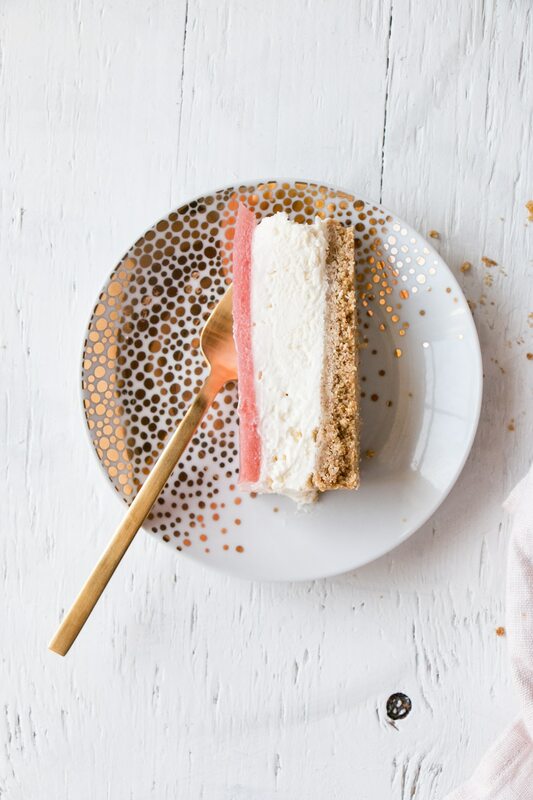 Oh my gosh....rhubarb, cheesecake AND no bake all in one?! I am DEFINITELY adding this to my list of have to try immediately desserts ;) Yum!! How did you get this to set? 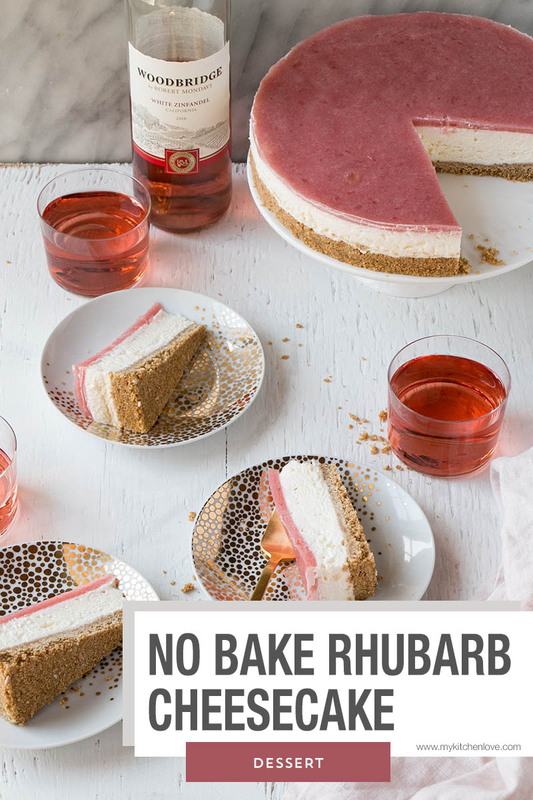 My friend and I tried to make this and the rhubarb turned out beautifully but the cheesecake itself was as runny as when it came out of the mixer. Stiff peaks never formed even though we made sure to beat the cream cheese until it was perfectly smooth. Thanks in advance! What type of cream did you add to the cream cheese? It needs to be whipping cream (33% M.F.) and that's where the stiff peaks form. The cheesecake sets in the fridge (in the 3 hours or overnight). The cheesecake mixture should be fairly thick when poured on top of the crust. Was a whisk attachment used? I wonder if I should add that to the recipe. We used the paddle attachment at first to make the cream cheese very smooth, and then switched to the whisk attachment when we added the whipping cream. We left it in the fridge for 3 hours, then added the rhubarb and let it set again. The rhubarb was perfectly set so we thought it would be ready but as soon as we released the spring form it ran all over the counter. We rescued the rhubarb topping and have been using it in yogurt though! That's really bizarre. There's enough cream cheese in there to firm up the centre so I'm not quite sure what happened. Mine was nowhere near that runny even when I transferred it from the mixing bowl to the base. The rhubarb will likely set quick from the gelatin, it's really the centre that needs the time in the fridge to firm up so it slices nicely. I made this and did not add the icing sugar as the method never told me when to add it. Didn’t realize this till I was done. Sadly the cheese part was not sweet at all. When are you supposed to add? Oh shoot! I'm so sorry Natalie. It's with the other cheesecake ingredients. 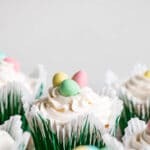 Recipe is updated now. I would love to try your recipe but I have no idea how to convert your US cups to grams or even UK ounces. The guidance on internet seems to relate to flour and baking ingredients. Hi there! I'm attempting to set up a conversion kit so that all my recipes get converted for you through the recipe card. Hope to have it sorted by the end of today.